Prototype: German Federal Railroad (DB) 6-axle railroad rotary crane car with Ardelt system steam propulsion with a lifting capacity of 57 metric tons, with a crane tender car (converted from a type Rms Stuttgart car) and an equipment car. "Bottle Green" paint scheme for the steam crane. Road number "Munchen 6664". The cars look as they did around 1958. Model: The crane car has an mfx+ digital decoder and sound functions. The crane superstructure with its boom can be rotated 360° on the ring gear. The boom can be raised and lowered by means of a pulley. The main hook made of metal can be raised and lowered by means of a pulley. The crane cab lighting can be controlled digitally. Two floodlights on the boom can be controlled digitally. LEDs are used for the lighting. The crane car has a built-in smoke unit that can be controlled digitally. 4 support arms can be swung out manually and they can be positioned with spindles on the bases included with the crane car. The smoke stack with a smoke hood can be removed or installed. A counterweight made of metal can be partially removed and placed on the buffer attachment. The crane car has a 6-axle car frame and a crane housing constructed of metal. There is a stake car (converted from a type Rms Stuttgart car) with a guide block as a crane tender car. A former Association Design type G car with end area reinforcement and without a hand brake functions as an equipment car. The minimum radius for operation is 437.5 mm / 17-1/4"! Total length over the buffers approximately 146 cm / 57-1/2". Maintenance and expansion of a rail network are essential for smooth railroad operations. Among the work required for this are the changing out of turnouts, the trimming of trees that have grown too high, or the rerailing of locomotives and cars. After accidents, locomotives and cars must be salvaged, rubble has to be removed, and rescue measures often have to be led quickly and efficiently under enormous time constraints. The conditions for this are often only suboptimal or simply bad. Sometimes a rail line has no road next to it or it is completely isolated such as in tunnels, on grades, or in deep cuts in the landscape. Often there is also a quantity of obstacles such as catenary, station platforms, masts, pillars and poles, or signal installations to manage. 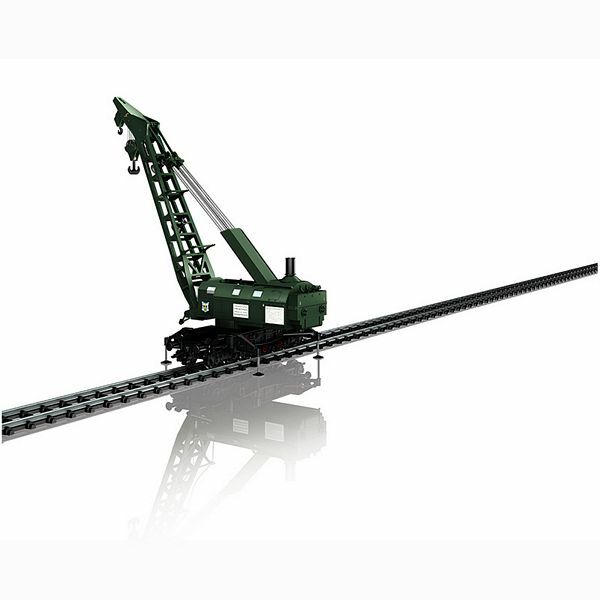 The railroad therefore needs cranes specially adapted to perfection for its requirements. 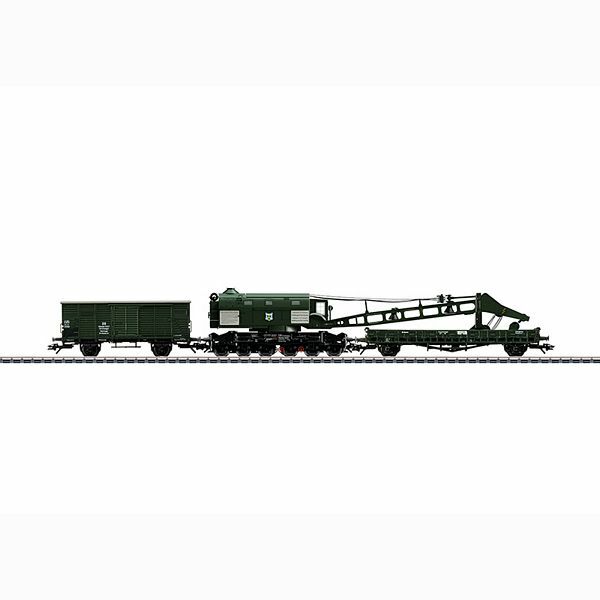 These units must ensure appropriate maneuverability and mobility on the track with and without a load, efficient power for lifting, supporting, positioning, and excellent maneuverability even in tricky areas difficult to access. There was a lot to clear away in the Western Zones after World War II and the DRG thus ordered four steam cranes in 1948 from the firm Ardelt. These units had a lifting capacity of 57 metric tons and were delivered in 1949. They were rostered by the just established DB as Essen 6660, Mainz 6600, München 6664, and Wuppertal 6602. 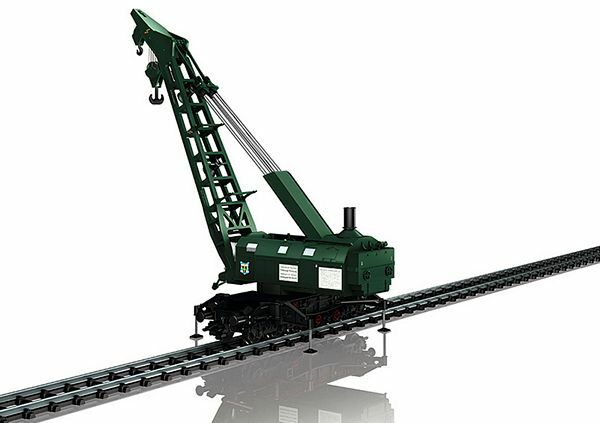 These cranes were designed in such a way that their counterweight could be stored on the sub-frame of the crane car and the lower parts of the counterweight could be stored by means of two spool wheels in the "hawker's tray" between the buffer beam and support arm pivots. This allowed an adequate boom swing on this six-axle unit without exceeding the center axle load of 18 metric tons and an acceptable support width of six meters / 19 feet 6 inches while still maintaining a maximum lifting capacity of 57 metric tons. During transport, the smoke stack addition merely had to be removed and secured behind and above the weights. The crane car's total weight was 106 metric tons. A stake car put in front with a mounting block as a boom tender prevented the boom from swinging out during transport. 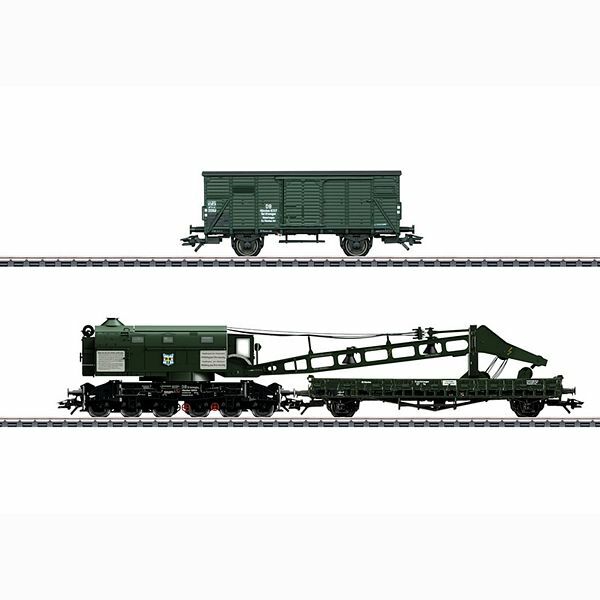 This 22.6 meter / 73 foot 5 inch long team was allowed a maximum speed of 80 km/h / 50 mph when used in freight trains. 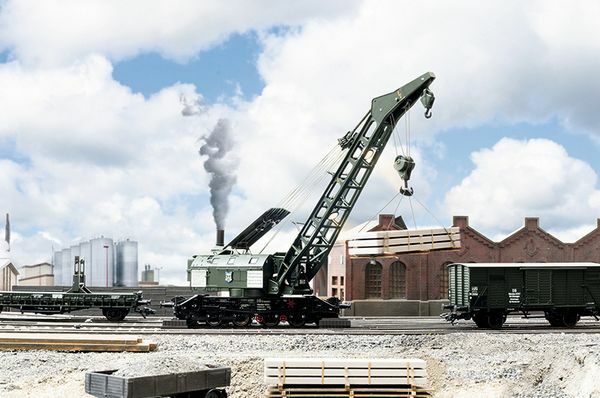 The main tasks of these cranes were placing locomotives and cars on the track, bridge construction sites, and reloading, whereby even the heaviest locomotives could be put back on the track by two cranes working together. A reversible 75 horsepower two-cylinder steam engine in the steam-powered crane provided the required drive mechanism. All four cranes were retired in 1978/79, but one remains preserved at the Auto & Technology Museum in Sinsheim. The former "6600 Mainz" can be admired there coupled to a fireless steam locomotive.